Osmosis: B cell development. (2019, April 20). Retrieved from (https://www.osmosis.org/learn/B_cell_development). B-cells develop in the bone marrow from common lymphoid progenitors. 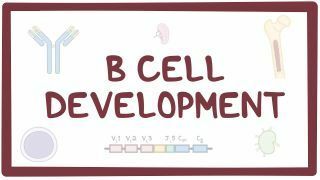 They begin as pro-B-cells, and then advance in sequence to pre-B-Cells, immature B-cells, and finally mature B-cells. The majority of B-cells that remain in the bone marrow become B-cells rather than T-cells. The early pro-B cell development stage is the starting point of chain recombination.